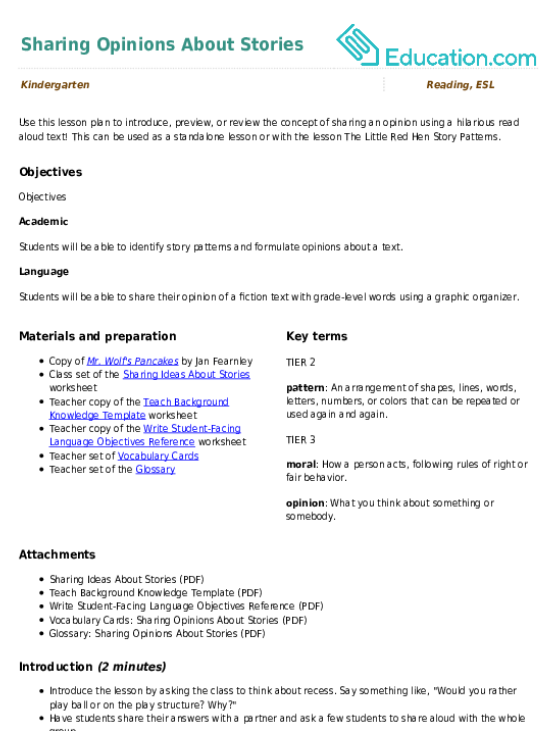 This lesson can be used as a pre-lesson for the The Little Red Hen: Story Patterns lesson plan. pattern: An arrangement of shapes, lines, words, letters, numbers, or colors that can be repeated or used again and again. moral: How a person acts, following rules of right or fair behavior. opinion: What you think about something or somebody. 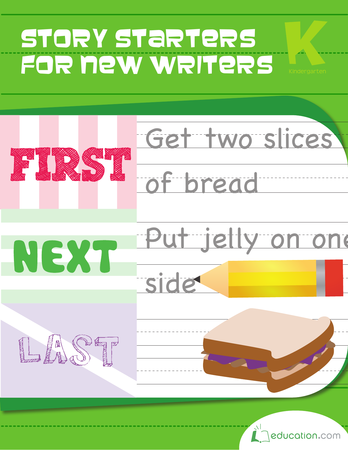 Students will be able to identify story patterns and formulate opinions about a text. 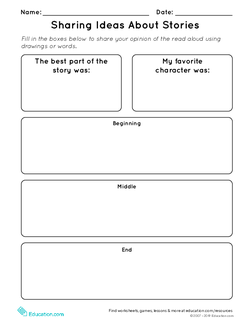 Students will be able to share their opinion of a fiction text with grade-level words using a graphic organizer. Introduce the lesson by asking the class to think about recess. Say something like, "Would you rather play ball or on the play structure? Why?" Have students share their answers with a partner and ask a few students to share aloud with the whole group. Explain that they just shared an opinion, or how they feel about something and why. Tell the students that today you will be reading aloud a story and asking students to share their opinion, or how they feel about the story. Introduce the vocabulary words for the lesson by providing student friendly definitions and utilizing the accompanying glossary and visual vocabulary cards as a reference. Invite students to share in their own words what each of the vocabulary words mean. Read aloud Mr. Wolf's Pancakes by Jan Fearnley. As you read, pause to notice the story pattern and encourage the students to read it along with you (by prompting them). For example, "Can you help me ____. No!" Pair students up to share their opinion of the story. How did Mr. Wolf's neighbors behave when he neeeded their help? Do you agree with Mr. Wolf's decision to eat the pancakes himself? Do you think he should have shared with his neighbors? Why/Why not? Bring the class together and ask them to think about the moral of the story. Discuss their ideas as a group. Provide students with their own copy of the read aloud text to reference. 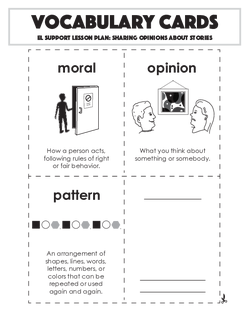 Have students share additional opinions about the text either verbally or in writing." Pass out copies of the Sharing Ideas About Stories worksheet to the class to complete independently. 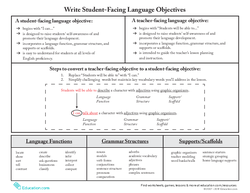 Provide students with sentence frames to use as needed. Informally assess if students are able to verbalize opinions during the paired work time. 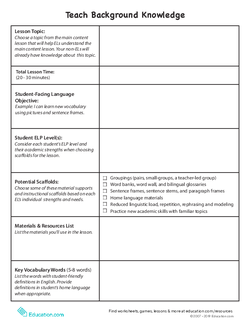 Assess students' ability to share their opinion during the independent work portion by collecting their worksheets. Gather the class together and ask follow up questions about the text. Review the importance of sharing opinions (helps us to think about stories and ideas, tells people how we feel, etc.). People often have different opinions, and it's okay to agree to disagree! 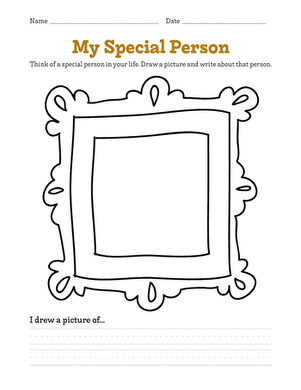 Practice identifying opinions with this worksheet. Telling stories not only builds creativity, it helps kids learn about communication.